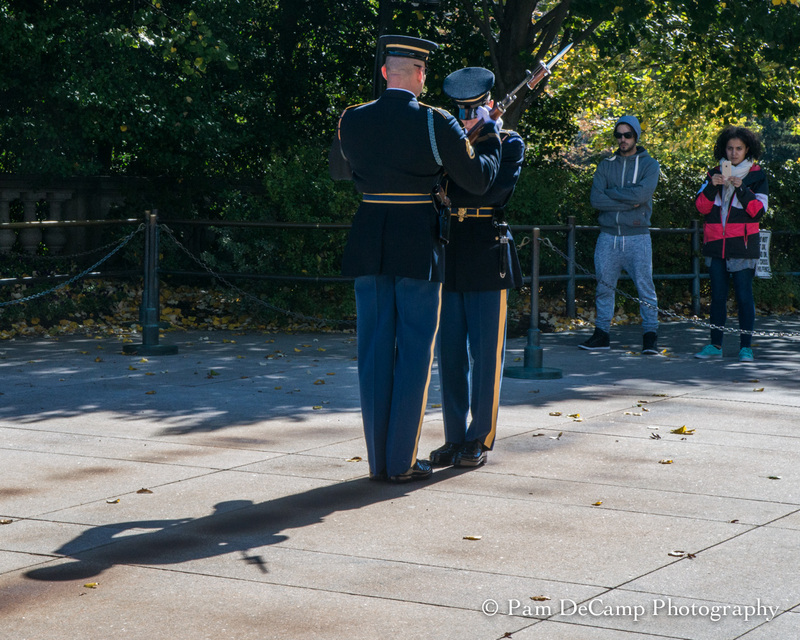 Veterans Day stirs many emotions for me. 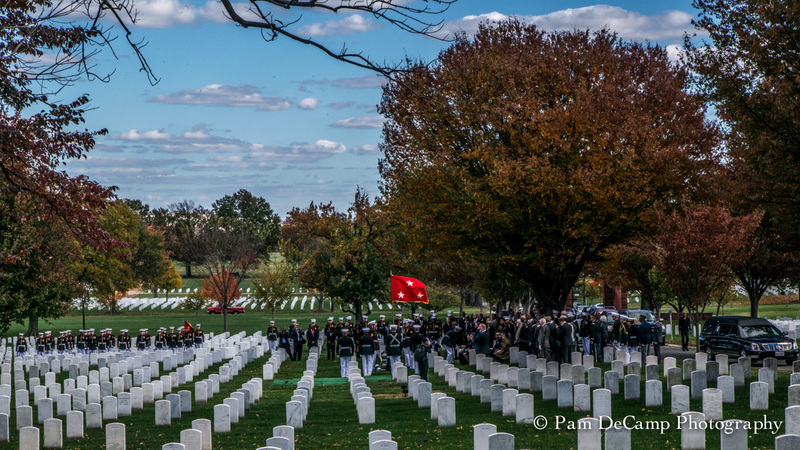 My father’s funeral was on November 11, 2011…yes, 11/11/11 (dad would have enjoyed the numbers). 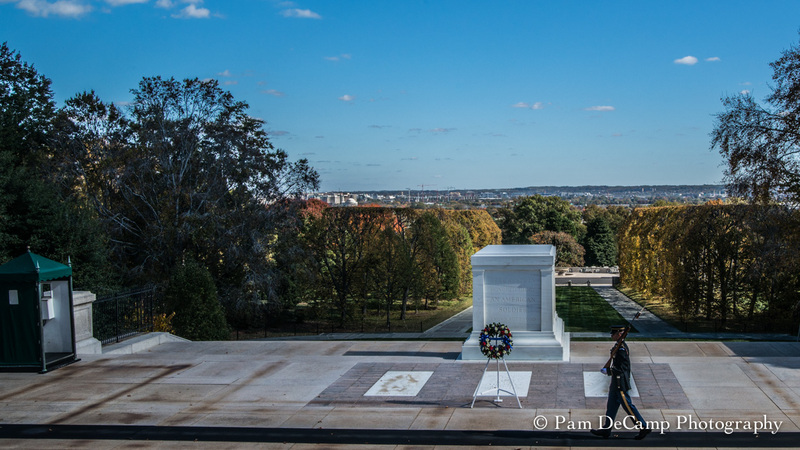 This fall I took a trip to our Nation’s Capital and have written a previous blog about visiting Arlington National Cemetery. 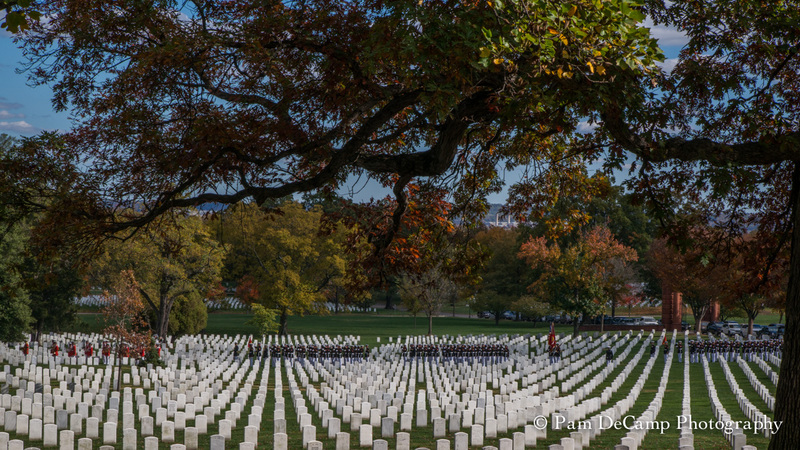 Arlington is the ultimate homage to our veterans. Many towns have veteran memorials to honor their fallen soldiers. My family has had strong representation in the military; US Army, US Navy, and US Air Force. I have had friends in all branches of the military. I have a great admiration for those who chose to serve in the armed forces. I seriously considered joining the Air Force in 1982; I had graduated college and was having difficulty finding employment as a photographer and had decided to pursue nursing as a career. My friend Cathy had enlisted in the US Army and asked me to join with her. I told her if I was going to go into the armed forces it would be the Air Force. I ended up going back to nursing school and made the choice to stay in Cincinnati. 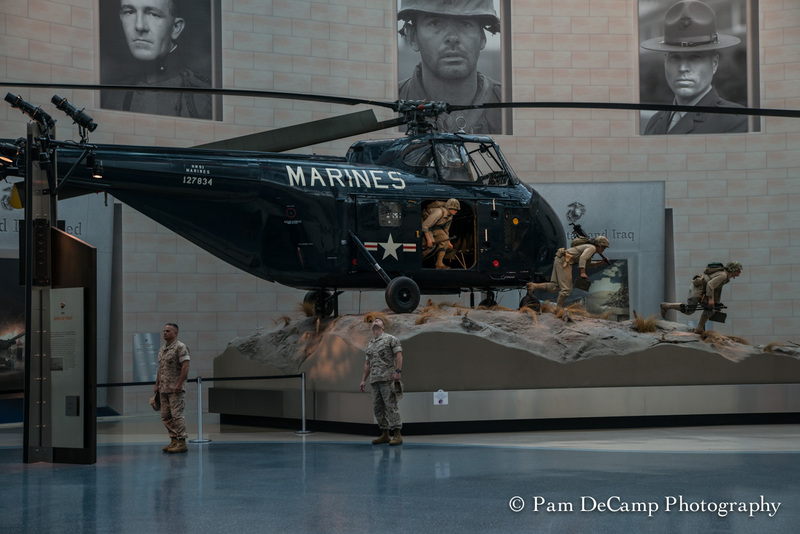 Over the years, I thought about the Reserves, but my biggest hesitation was basic training. I hate running! I never could run; I would try and that reported runner’s “high” never happened for me. Basic training scared me, I dislike confrontation, I dislike yelling…so I decided I had better stick with the things I was good at. My father always attended the High School Veterans Day assembly. The final year I attended with him (2010) was very memorable for me and it was always emotional for him. 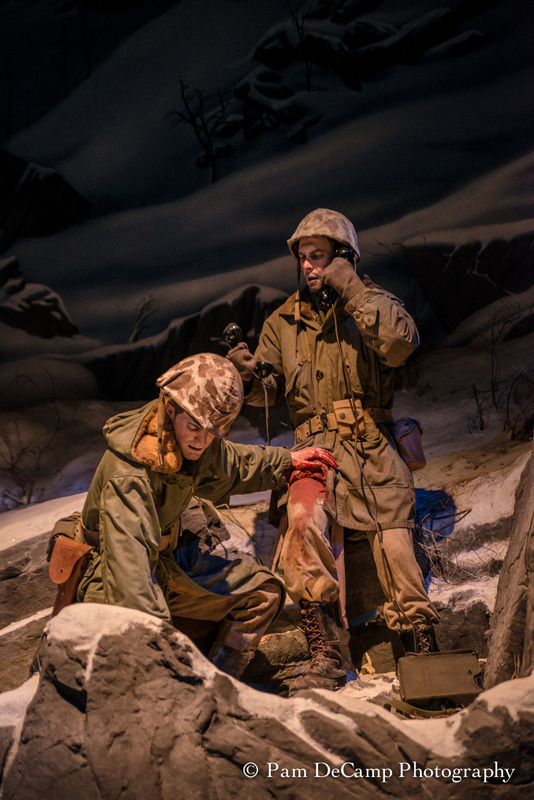 The playing of taps always brought tears to his eyes, that day was no different, I was glad I was with him. While en route to Washington DC, there was structure in the distance at the Quantico exit. 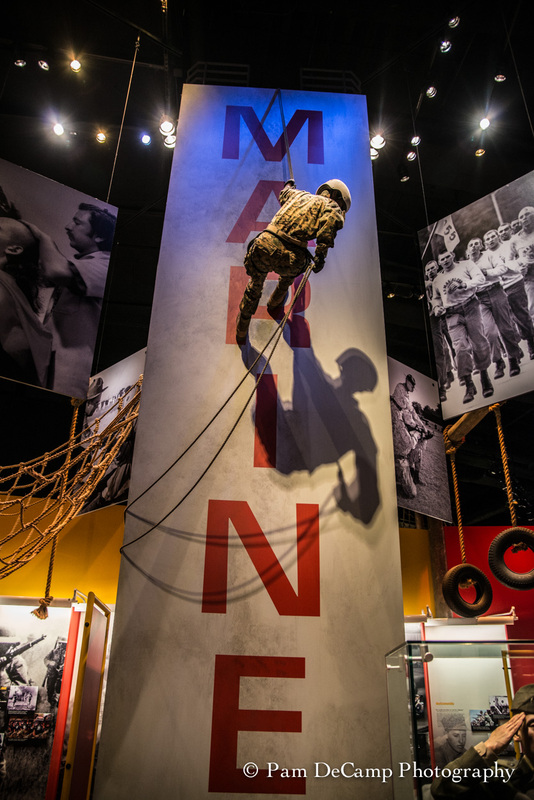 On the sign it said National Marine Corps Museum. I was in the center lane and made my way to the exit. 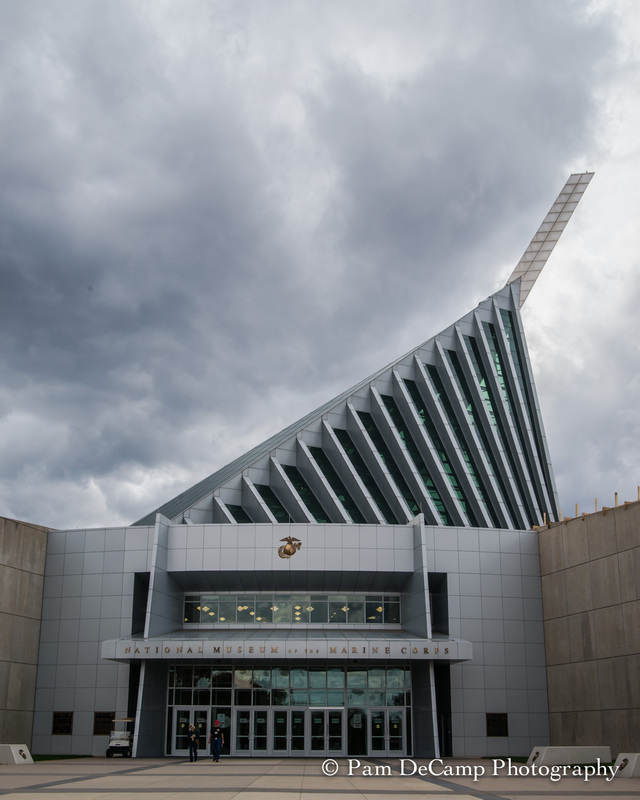 The roof of the building is a striking image against the landscape. I was excited to walk through the doors to see what was inside. Many times I found myself in tears while reading the information in the displays. There were 2 instances I took serious pause. The first was when I was reading about a dog who had been trained to detect IED’s and how he died while riding in a vehicle that struck an IED in the road. His handler donated all of the dog’s belongings to the museum. It was very touching. The dog had saved many lives during his service detecting the same device that took his life in an accident. The second time I took pause was when I was reading about Afghanistan. In 2011, there was heavy combat, I had to read it more closely. My cousin Andy was stationed to a unit in Afghanistan during that time. It was a very emotional moment for me. I realized, then, how people are changed in combat. I have great respect for individuals who choose this life. 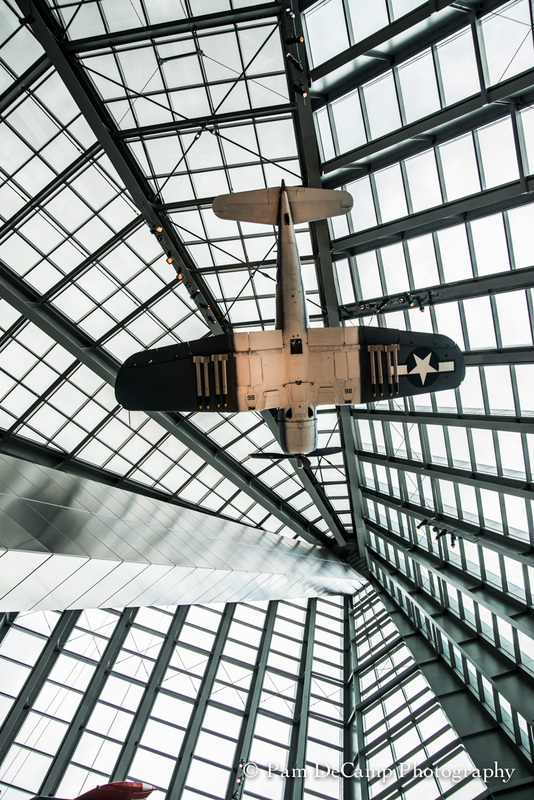 I marveled at the exhibits. What fascinated me was listening to people tell their “stories”. One young man talked about a fellow soldier who had been injured in Afghanistan and how he was “somehow different” than what he was before the experience. One exhibit was a boat with the drop down at the end. I heard older gentlemen talking about his experience in WWII. He stood on the boat and recounted how an entire squadron was lost when the boat they were on landed on a sandbar and when when they stepped off in full gear they drowned. 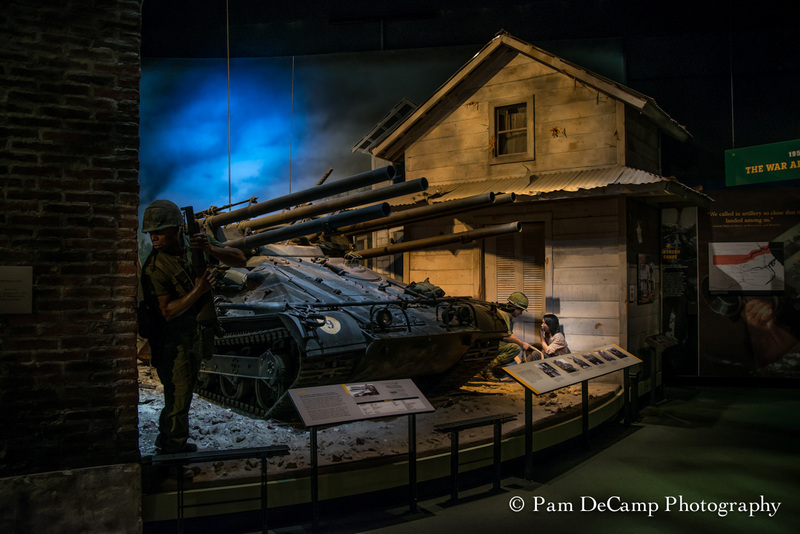 My impression of the museum was if you are a soldier suffering from PTSD it would be a difficult journey though the museum. 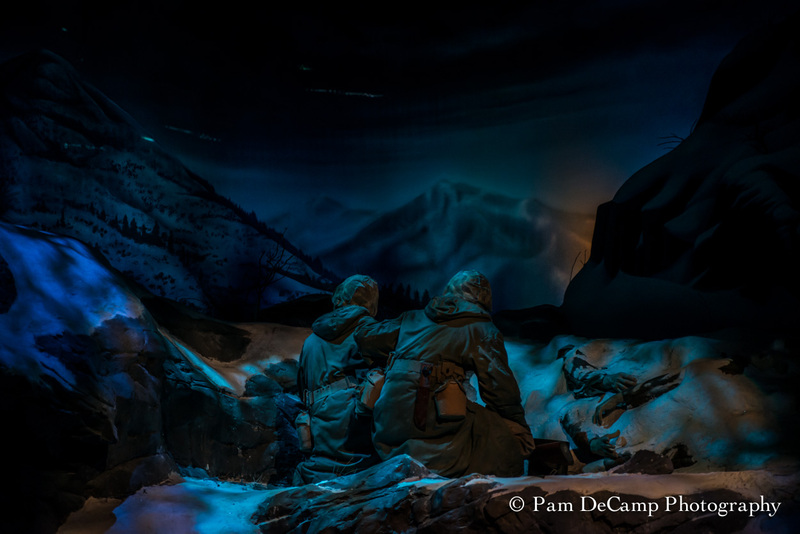 The sound effects were realistic; the exhibits were graphic. 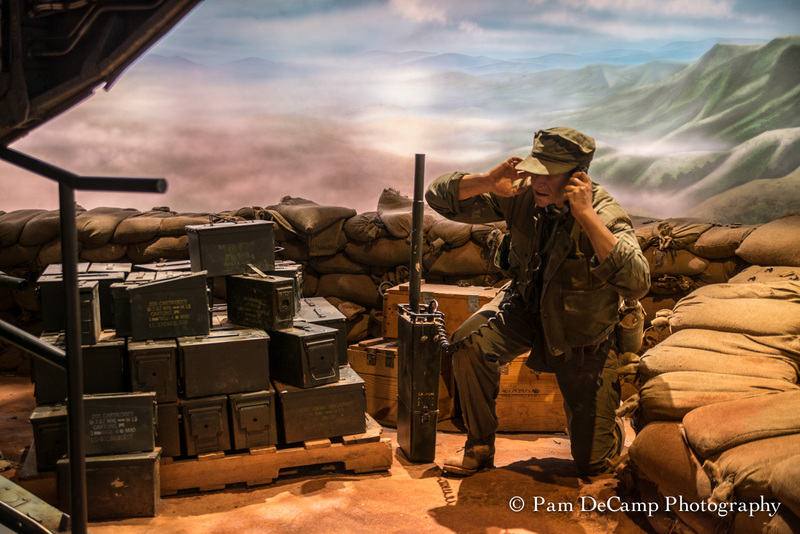 The voices, the shells exploding, the visual stimulation of the exhibits put the visitor in the middle of the action. I enjoyed walking through the museum. It transports you through time. My favorite part was the firing range simulator. For $5 you can fire a stripped down AK-47, that fires a laser simulated bullet at 300 yards. I had to give it a try! The high score that day was 95%; the big difference was no recoil; no kick. I held steady, I had one shot go outside of the center of the target…my score…85%. I was thrilled! 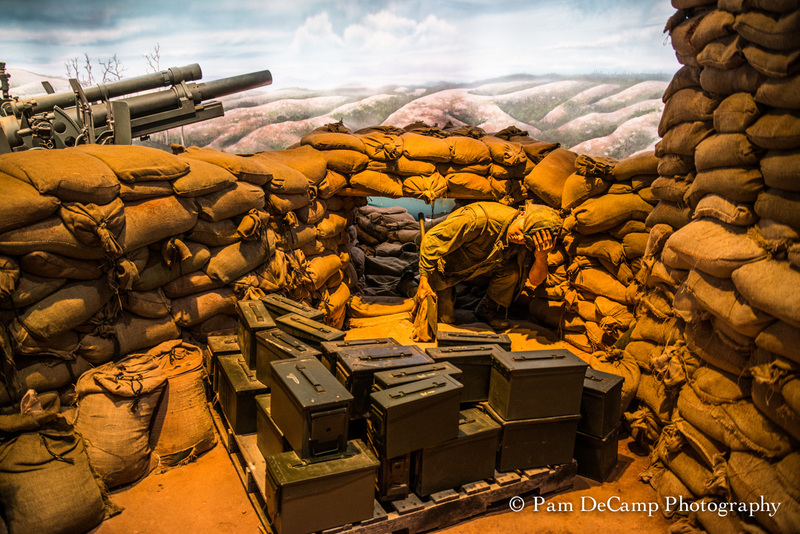 I need to spend a little time on the firing range! 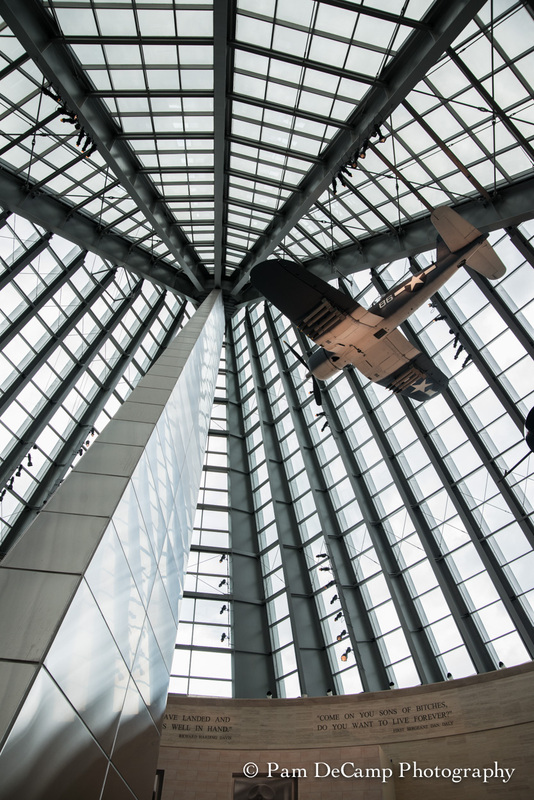 The museum was a stop worth taking. In the almost 2 hours of time spent at the museum, I did not leave the first floor. 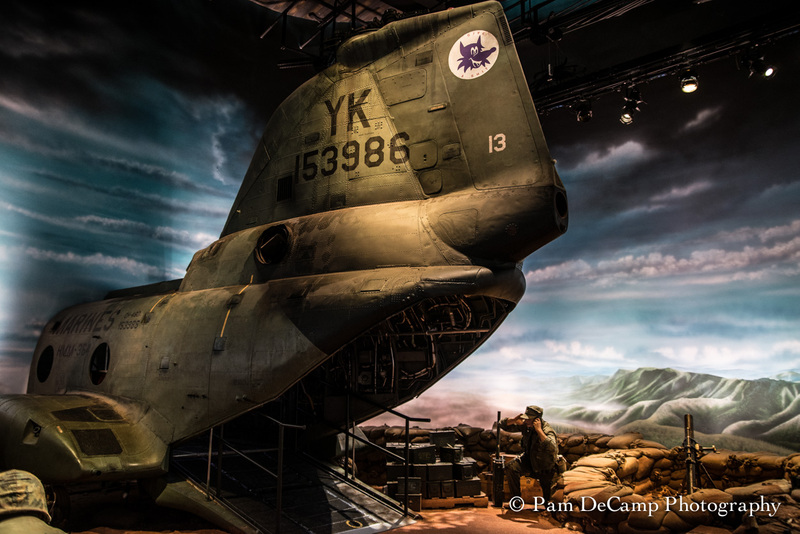 There was so much to see; all of the exhibits were a transport back in time. Over the years our country has been protected by young men and women who have barely adulthood. They are given weapons and are trained to kill. We do not always understand the physical battles. The emotional battles these young men and women face and carry with them for the rest of their lives are at times terrifying. When I see someone in uniform, I take a moment to thank them for their service. Thank someone you know who has served our country. 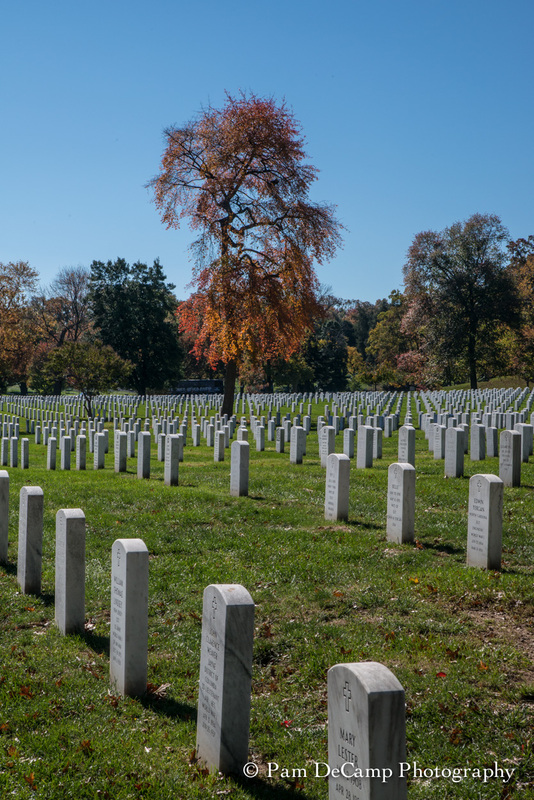 Whenever I am in the Washington DC area I always pay a visit to Arlington National Cemetery. 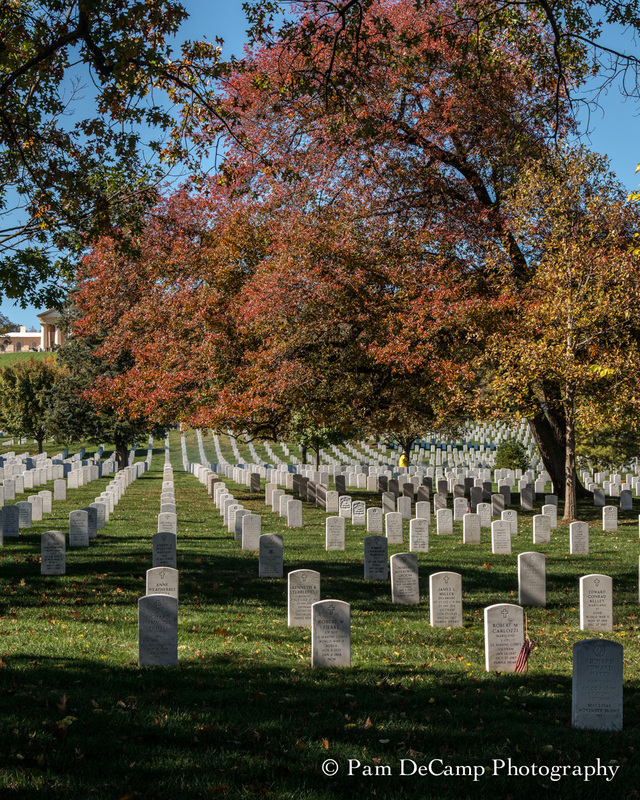 For me, Arlington is a humbling experience. 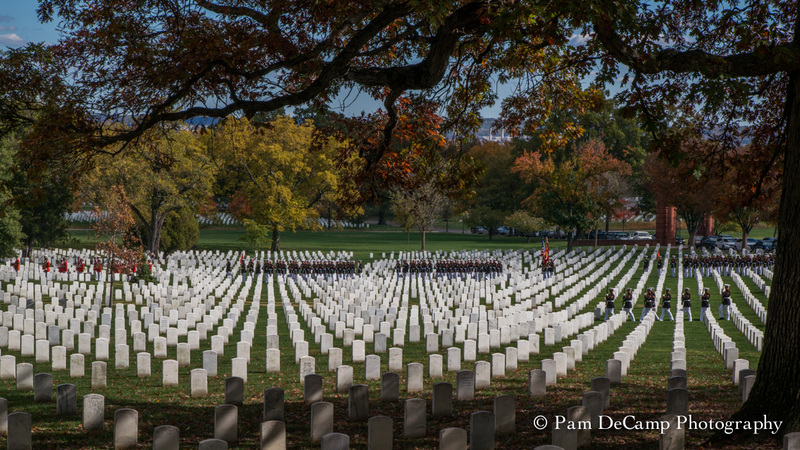 Each marker represents an individual…son, daughter, father, brother, sister…who has fought for our country. On the day I was there they were cleaning the headstones, no wonder it always looks pristine! I watch people look and observe, it is a place of reverence. There is a sense of respect and honor. 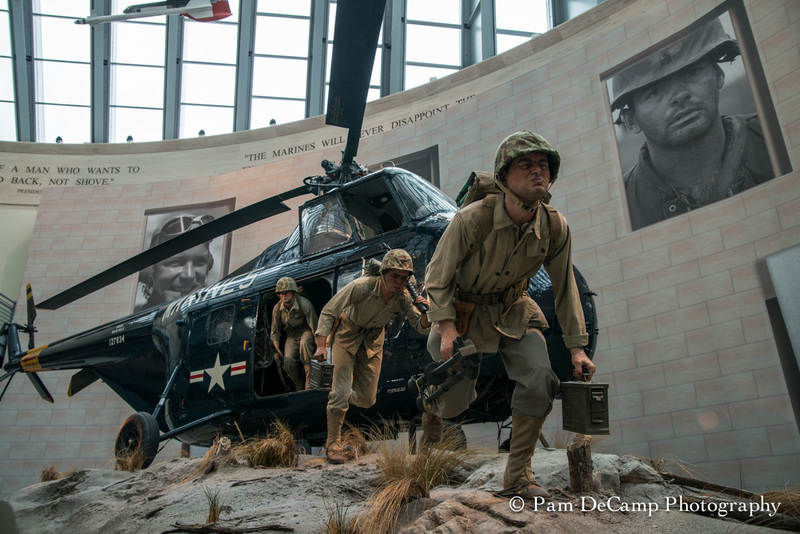 If you ever visit Washington DC put Arlington into your plans. My friend Julie went on this trip with me and she had never been to Washington DC. 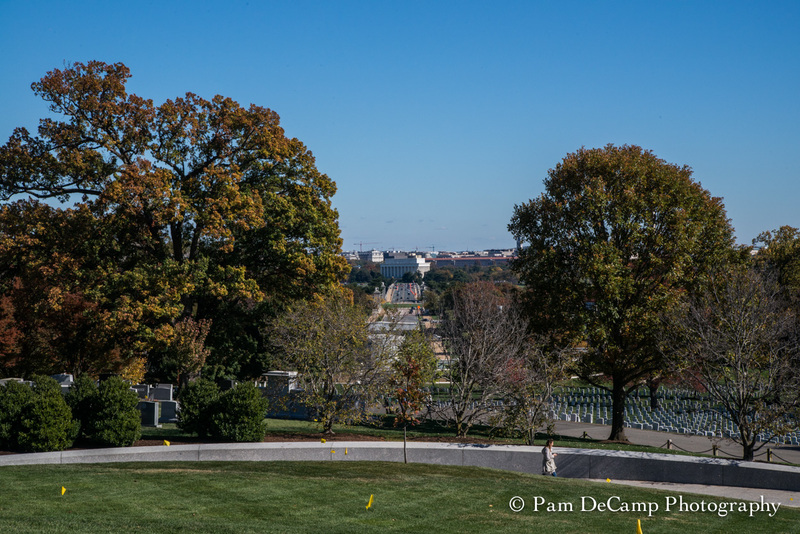 I promised to show her the highlights which included a stop at Arlington National Cemetery. We arrived at approximately noon and we walked through the visitors center then out into the cemetery. 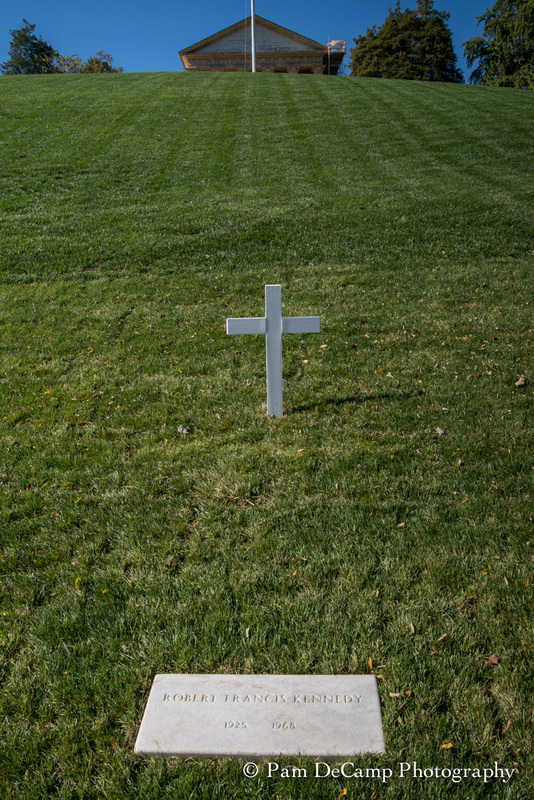 Our first stop was JFK’s place of rest. I do remember when he was shot and watching the coverage on our old black and white television. It was a sad feeling, although I was very young at the time it is a memory that has stayed with me for my entire life. Then shortly after was Robert Kennedy and Martin Luther King. 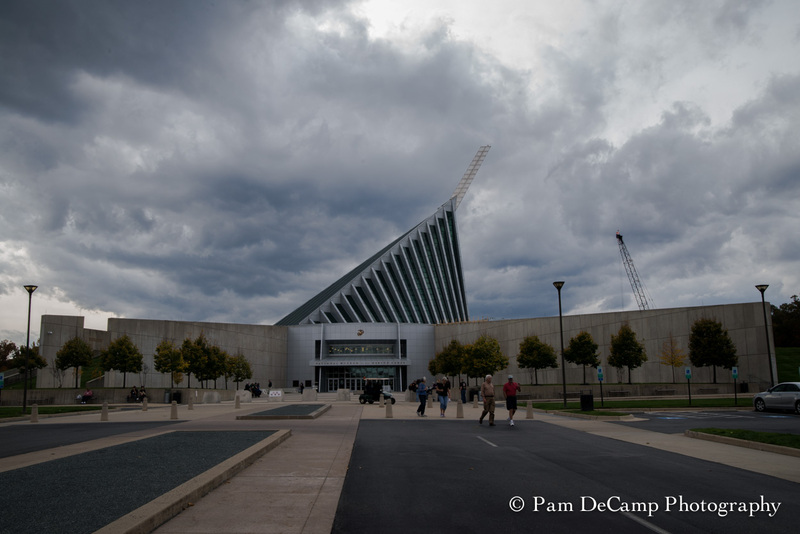 My first impression when I visited Arlington several years ago has not changed. It is overwhelming to take it all in at once. The only sounds heard at JFK’s grave were the clicks of cameras and the mechanical sound from the cell phones that imitate the sound of a shutter opening and closing. We walked to Robert Kennedy’s grave. When looking at JFK’s grave then going to Robert’s there is a stark contrast. 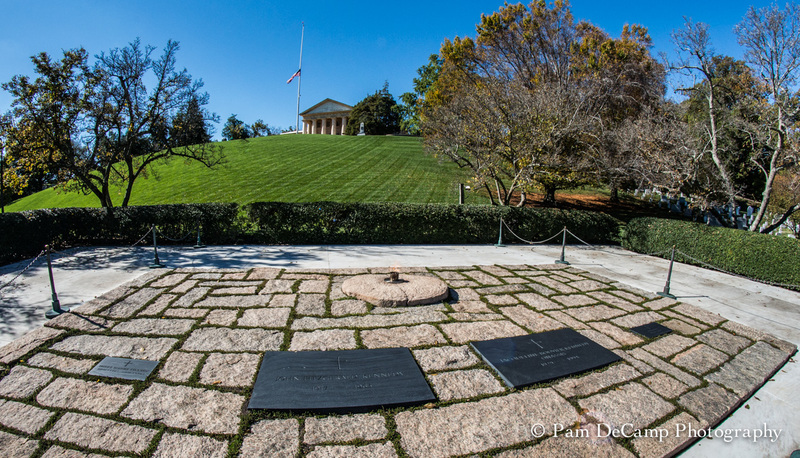 JFK’s resting place is more elaborate whereas Robert’s is very modest. They both have walls with engravings of their famous speeches. Robert’s site has a fountain, but it was not functioning while we were there. 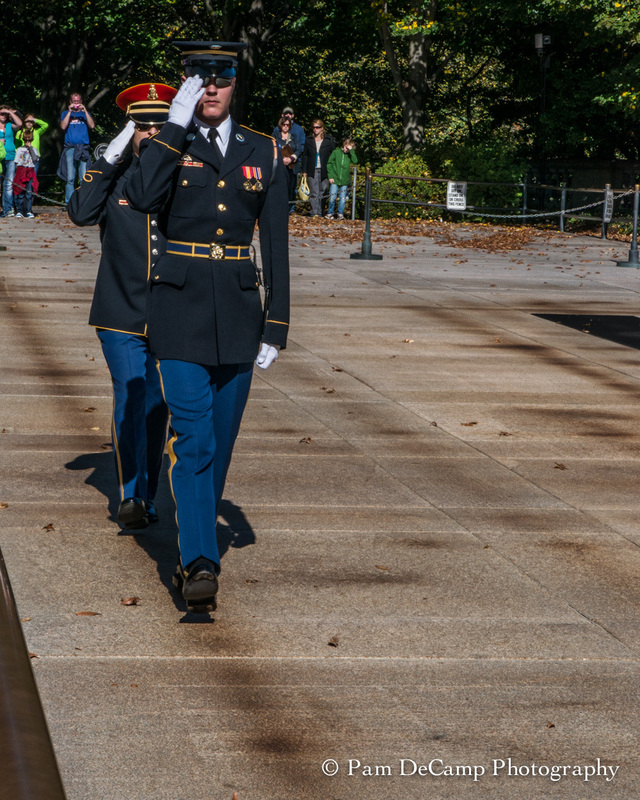 As we continued our walk to the Tomb of the Unknown Soldier, I noticed 3 canons at the foot of the staircase. I told Julie they must have something special going on because the canons are not a normal site at the cemetery. 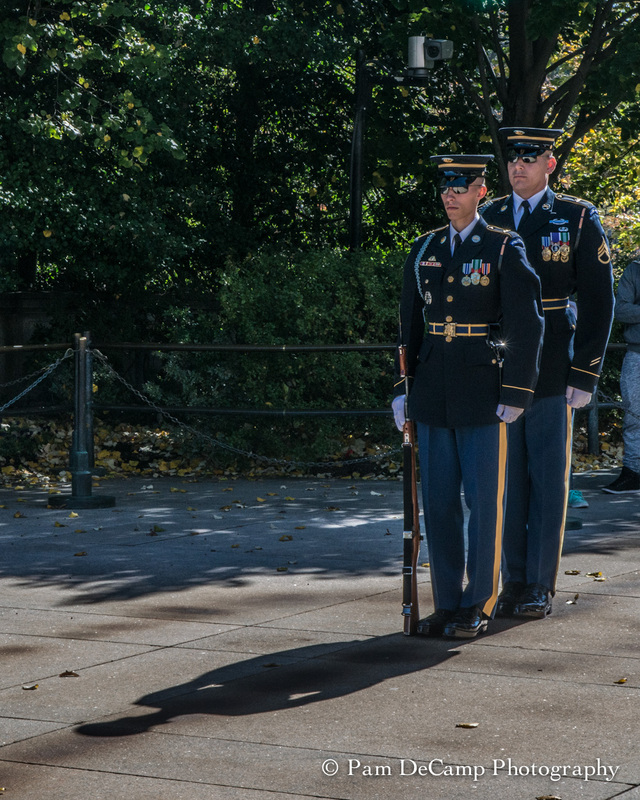 I always go to see the changing of the guard. It is a solemn event. 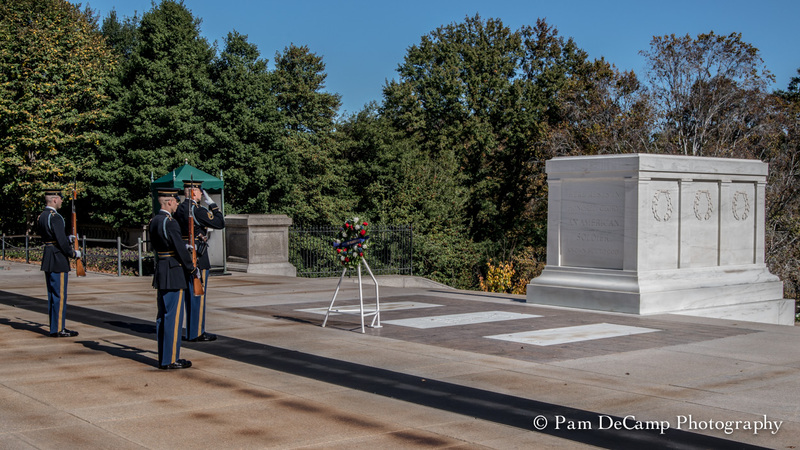 The young men who guard the tomb have dedicated their lives to this charge. 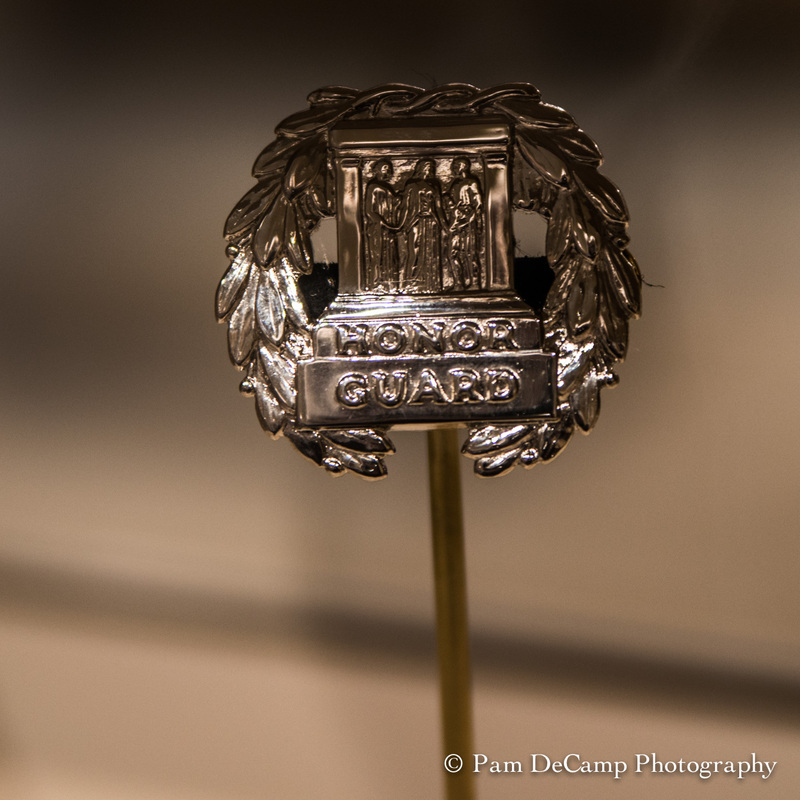 It takes much discipline to be a guard. The honor that is bestowed and entrusted on those who serve their country in this capacity is more than what words can ever describe. 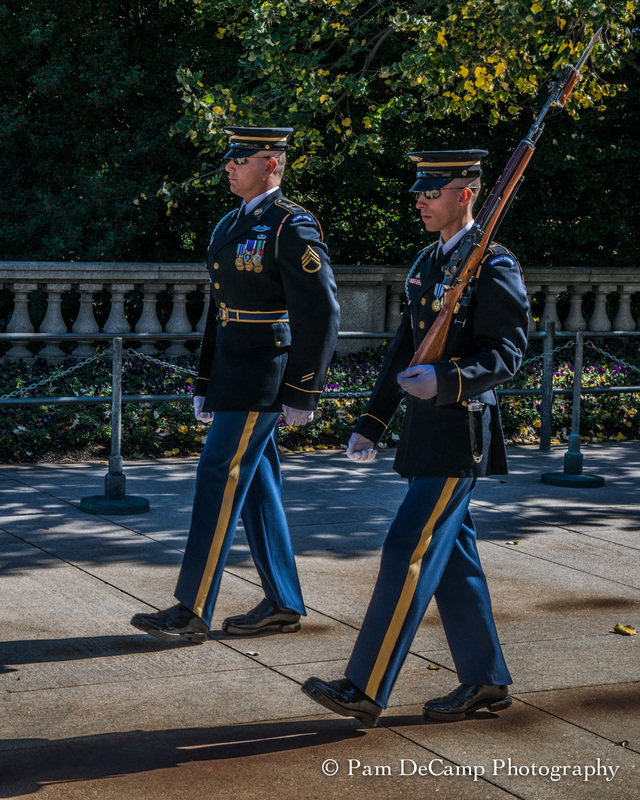 The precision in which the guard walks his 21 steps and the “click” you hear, often sends chills through my body. 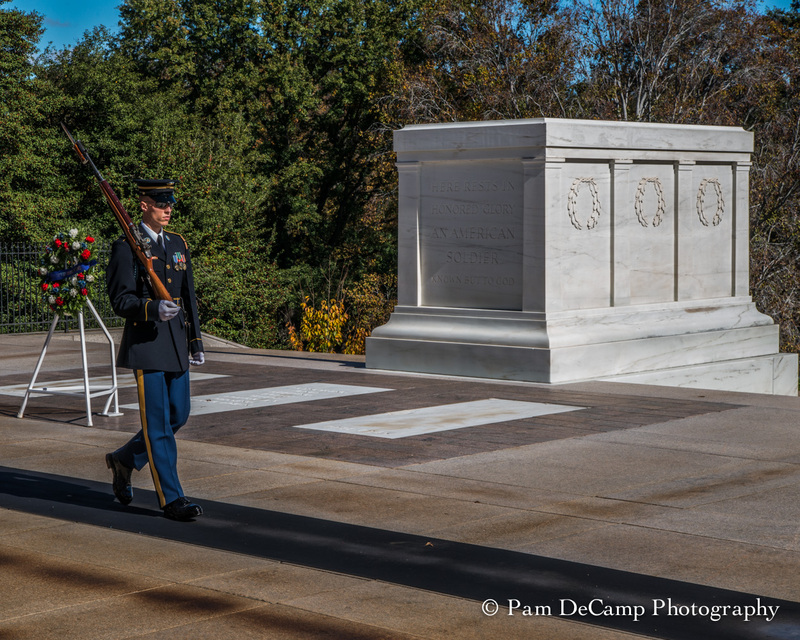 When the new guard comes into the hallowed ground he is inspected, head to toe, his rifle is checked, they walk in cadence with the guard who is watching the tomb. 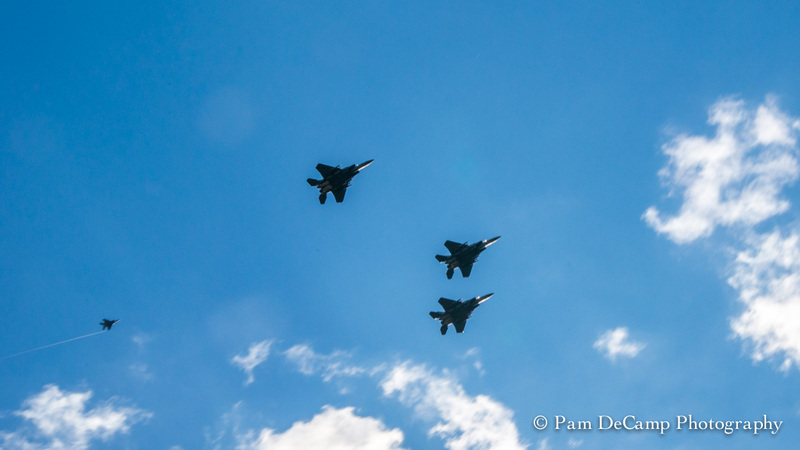 Just as the changing of the guard ceremony ended I heard fighter jets in the distance. I raised my camera and started clicking away. 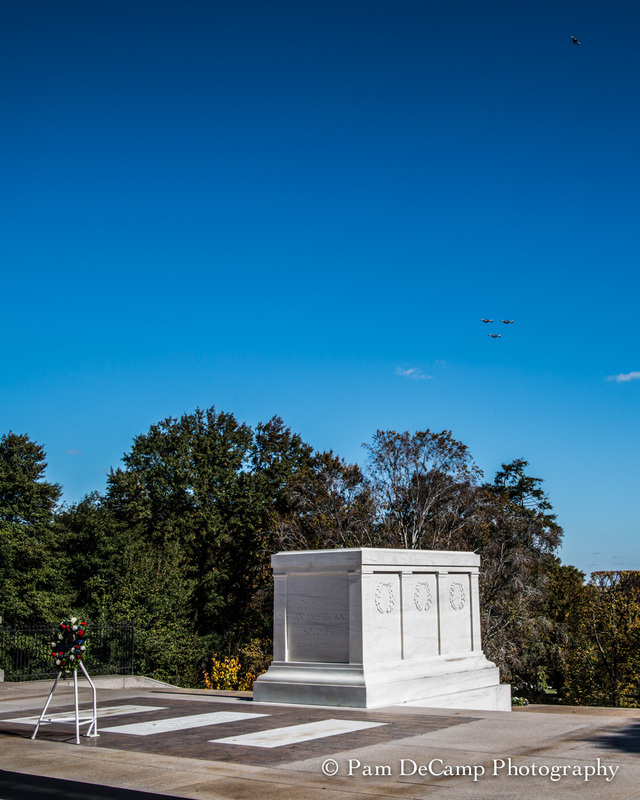 I saw the 3 jets flying overhead and I told Julie, “This is not a normal occurrence, I wonder what is going on?” In just a few moments after the new guard took his post a canon was fired. I knew then there was something else going on at the cemetery that was of high importance. 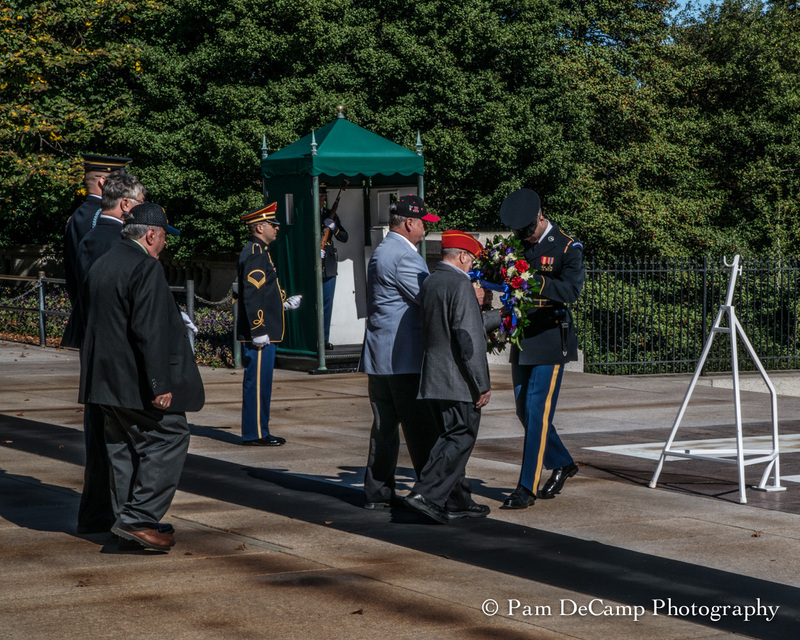 Moments later it was announced they were going to do a changing of the wreath ceremony. Only one other time have I witnessed this. I told Julie she was very fortunate that she was here to see this. 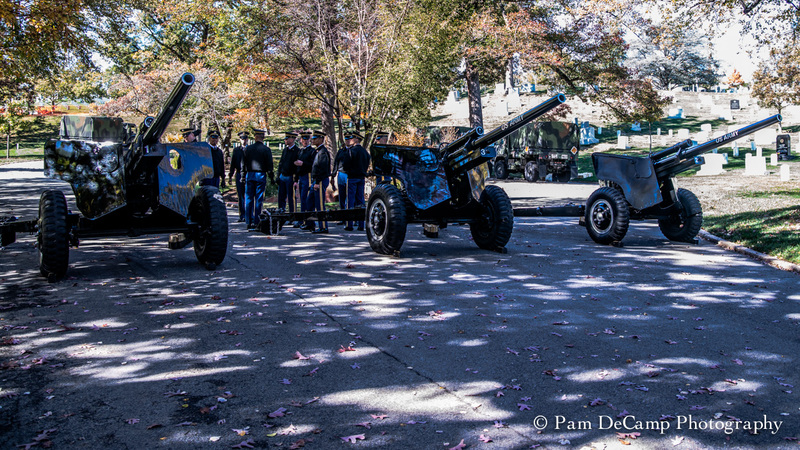 The canons continued to fire during the wreath ceremony. We started down the hill and we chose to go the less traveled path to make our way back to the visitors center. As we came around a turn I saw a hearse (we had seen one earlier in the day so we figured there was a funeral). 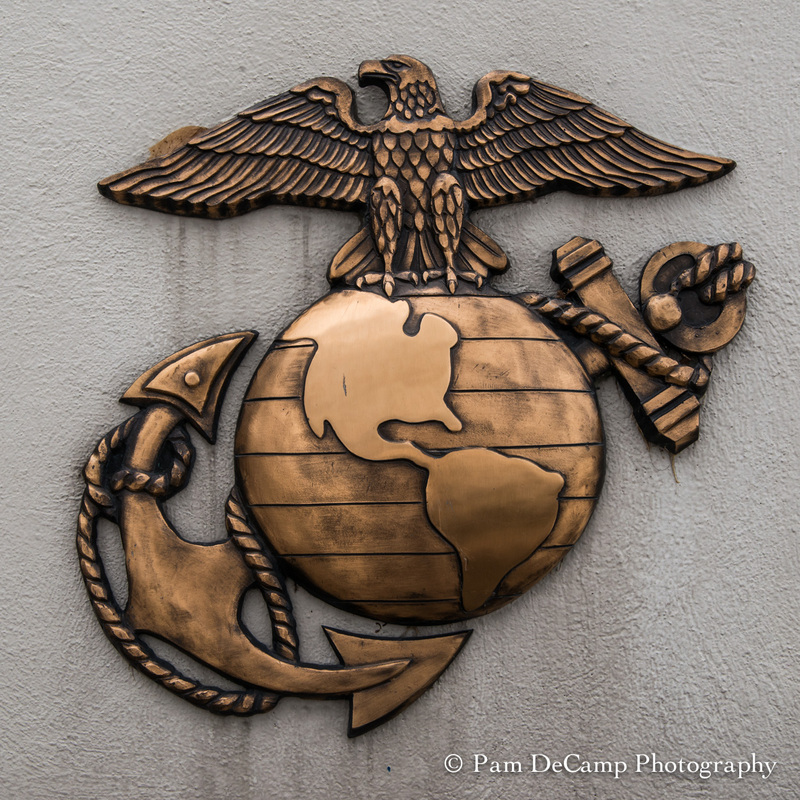 I also noticed two Marines standing at the entrance to the road. There was a funeral. We made our approach, and I saw numerous troops, an honor guard, and a band gathered in the distance. My jaw dropped. 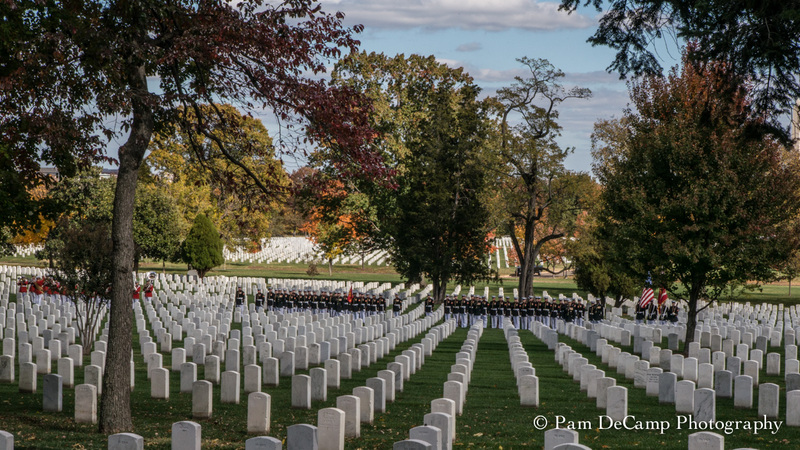 As many times as I have been to Arlington I had never witnessed a funeral. However, this was not an ordinary funeral because of the shear numbers of military present. This explained the fly-over and the canons. 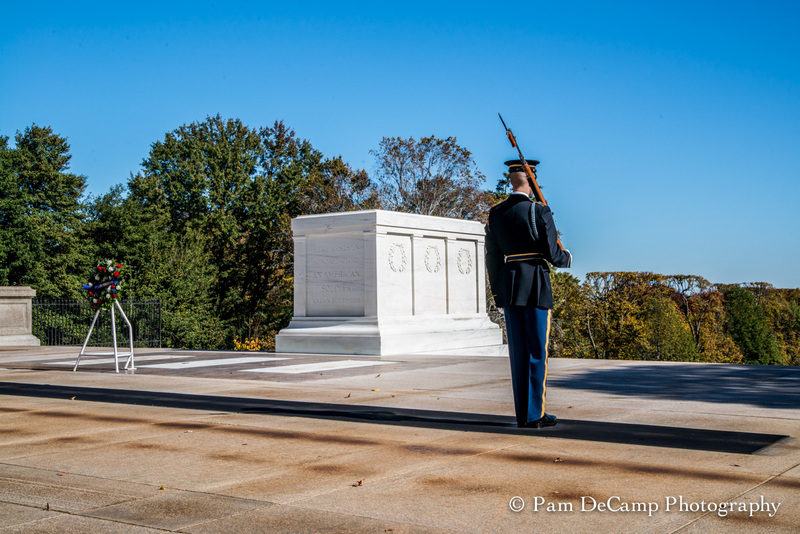 I stood quietly while they gave the 21 gun salute and the playing of taps. The photojournalist in me was itching to take pictures and all the while kicking myself for not bringing my big lens that day. I started taking a few photographs here and there to commemorate this moment. The one thing that stood out for me was the red flag with 3 white stars. My guess was a 3 Star General. This was a big deal! October 30, 2015 will always remain a special memory for me. My dad had great respect for those who served and fought for our country. 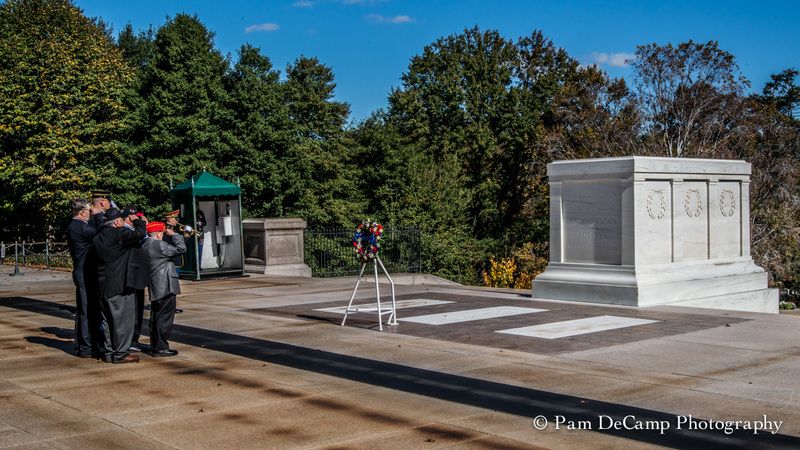 He always was insistent that when I went to Washington DC I should go to Arlington and watch the changing of the guard. He would have enjoyed this visit so much if he could have been there. I thought of him often that day. He always became emotional during taps. I am so proud of our service men and women who dedicate their lives to serving our country. They give of themselves to fight in battles that many of us do not understand. God bless our troops and our country. Protect and watch over all of our soldiers. 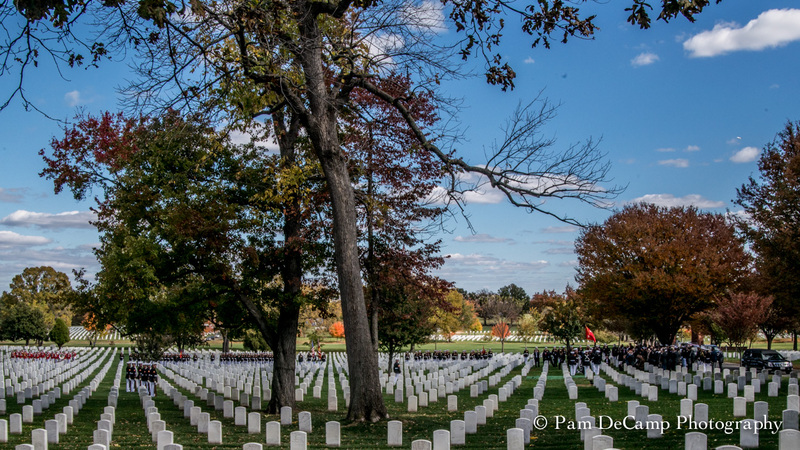 A few extra photographs from Arlington National Cemetery. 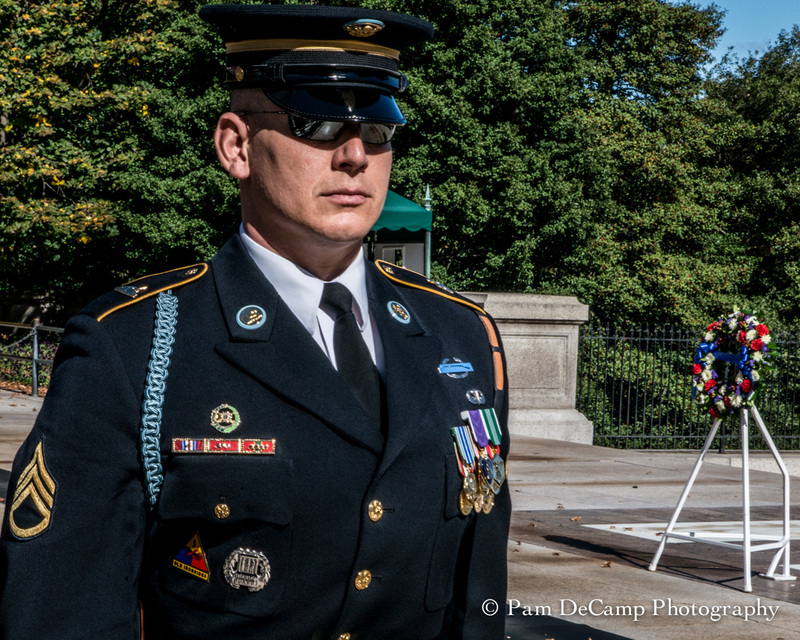 The commander of the Honor Guard; note the symbol of his command on the lower left. He also has a Purple Heart Medal.